Learn to farm or garden with community created guides! 1,605 backers pledged $24,293 to help bring this project to life. OpenFarm is a free and open database for farming and gardening knowledge. Similar to Wikipedia, the data is free for everyone to access and anyone can contribute content. Because people grow plants differently based on environmental conditions and growing practices, OpenFarm provides a framework for everyone to share their story, and for learners to find the best, most relevant content. OpenFarm Growing Guides are structured stories for growing a specific plant with particular practices and environmental conditions. Below, is a mockup example of Nancy's Guide for growing Heirloom Tomatoes with organic practices, in a greenhouse. Below the image are descriptions for each of the sections of the guide. Click here for a larger view of the image! See what the Growing Guides will look like on a smartphone here. In the example above, the Overview serves to introduce the reader to the guide by providing a photo of the plant at its maturity and a personal note from Nancy. There is also a table of contents for quickly jumping to another section. Next is the Prerequisites section. Nancy has specified what prerequisites are required for her Guide, and based on the reader's OpenFarm profile a "Compatibility Score" is created. In the example above we see that Nancy's guide is 84% compatible with the reader and their garden because most of the prerequisites have green backgrounds, indicating that they are satisfied. Others have yellow and red backgrounds, indicating that they are not fully satisfied. Mouse-over tooltips show why each prerequisite was satisfied or not. Following the Prerequisites section is the Timeline, allowing the reader to quickly see if it is the right time of year for them to grow the plant. The timeline is based on the reader's local weather history, and the Growing Degree-Days that the plant is projected to experience in that location. During the flowering stage, prune 30% of budding flowers, once, 1 cm from the flower base. During the juvenile stage, mulch 3 inches of straw at the base of the plant. During the adult stage, water for 2 minutes per plant, with a hose, 6 inches from the rootstalk, in the early morning or late afternoon. During the fruiting stage, if you have a problem with aphids, mist the entire plant with an organic insecticide of your choosing. In addition to the Life Stages, an Overview informs the reader of what tools, fertilizers, pesticides, and other supplies are called for throughout the Guide. A Summary lists expected time commitment and water usage over the plant's life, and other cumulative figures. The last section is the Forum where the community can discuss the Guide, ask questions, post photos, and share additional advice. Forum posts can be tagged, searched, filtered, and given the "Green Thumbs Up." Individual Guides will not be relevant for everyone, therefore an unlimited number of guides can be created for each plant. Some will be similar while others may be tailored to very different environmental conditions, plant varieties, or growing styles. When users search the OpenFarm database they will be shown a list of all Guides that match their search term, sorted by compatibility and rating. The search results may be filtered by sun-shade requirements, growing practices, soil types, and more. 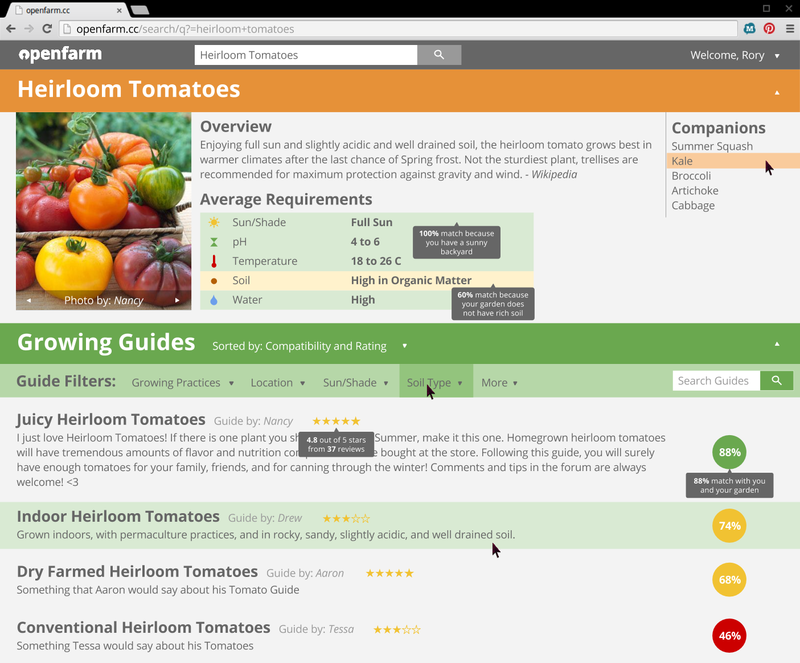 Below is a mockup example search page for Heirloom Tomatoes. OpenFarm is not just for edible plants! Growing Guides could be written for flowers, mosses, trees, vines, and other ornamentals. Dirt not your thing? Growing Guides could be written for hydroponic and aeroponic growing, as well as for water plants. Municipalities and organizations could use OpenFarm for habitat restoration projects. Down the road we hope to build "Polycrop Guides" offering advice for growing a set of plants together. In addition to openly licensing the data we are building a RESTful API for other applications or research projects. Today we have a barebones Ruby on Rails application built. One can create a user account, contribute data, and search the database. Check it out for yourself at openfarm.cc! Interested in contributing to the project? Our code is hosted on GitHub. Check out the open issues, fork the repo, fix stuff or add things, and send in a pull request to master! 1) $2,500 will go towards hosting fees for the first year of running the website. 2) Every volunteer based project needs a champion to get off the ground. $3,500 will be used to provide a stipend to our project's champion to nurture OpenFarm in its early stages. The champion will provide vision, coordination among project contributors, and be responsible for keeping the project on track and moving forward. The remaining $1,500 will go towards reward fulfillment and Kickstarter fees. Any additional funds raised will be saved for future hosting fees and paid development time. OpenFarm is a small step towards a sustainable future. By sharing our knowledge in an accessible and relevant manner, we empower ourselves and each other to take action. Growing a garden, restoring native habitats, landscaping more efficiently, and understanding our relationship with the environment are critical steps in our journey moving forward. Help us build OpenFarm for everyone to enjoy! As a volunteer created project, we always face the challenge of development slowing down due to a lack of volunteers actively making contributions. However, with the support we have already received this early in the project, and the dedication the current volunteer team has shown, we feel that we are only going to pick up momentum from here! Digital "Backer Badge" on your OpenFarm profile + follow our progress with campaign updates!